Oh, you write books? What about? This is the question I dread the most. It shouldn’t be, but it is. 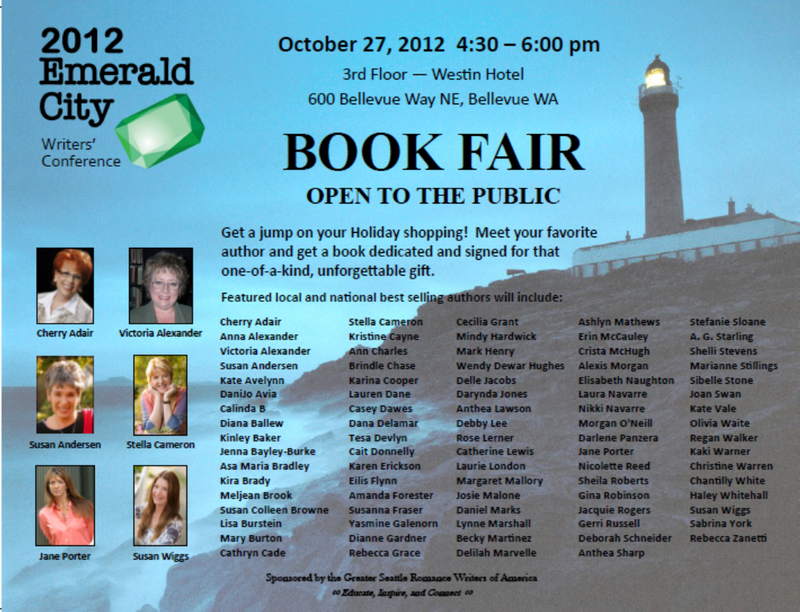 In three weeks I will be a part of the Emerald City Writer’s Conference Book Fair which is open to the public. I will be sitting next to the likes of Cherry Adair, Susan Wiggs, Jane Porter, Yasmine Galenorn, to name a few. I mean I won’t actually be sitting next to them. Likely I will be shoved in a corner with a stool since I’m not really a staple of the romance industry…yet! I have had several sleepless nights in the last few weeks pondering how I am going to sum up my book in a few words to those who are kind enough to stop and ask me what my book is about. And a few sentences will be all I have. No one likes to hear an author prattle on about her entire book. It’s already obvious to anyone at this conference that what you write has something to do with romance. It’s a romance writer’s convention! So how do I set myself apart without alienating myself? I was talking to my husband about the fact that readers either seem to love or hate “fantasy” stories and I think a lot of that has to do with the idea that fantasies seemed to be laden with foreign sounding names, peculiar creatures, and a whole new set of world rules. Some people love that, and some feel overburdened by it or can’t relate. I think the type of “fantasy” story I write isn’t hard to swallow in any way. It is why I tend to lean more towards the description of “paranormal romance” which many associate with vampire love stories, because it is more familiar and not weighty. However, my stories do take place partially in a fantasy setting, so I can’t get away with that entirely. Most people say my stories are “fun” – which conveys the lighthearted adventure style I write in, but doesn’t tell you much about the plot. I write romance novels in a fantasy setting. The main character of Fae Hunter is Valora, a winged fae who tangles with men that literally have magic fingers. She also goes on a quest to save her world which lands her in the suburbs of Seattle — and she’s not a fan of coffee. Fae Hunter is an adventure style romance. Valora Delos is a fae from the Realms who lands the job of being the only one who can save her world. Tough, especially when there are two extremely hot men to distract you. The answer to her problems lies somewhere in the city of Seattle, a hotbed of supernatural creatures skirting humanity. From battling dragons to battling traffic, Valora Delos is shoved through a portal from the Realms to Seattle to find the answer to why her world is dying. She is barely able to dust off her wings when she is faced with the second man to make her knees go weak – the other being her own King back in Dell’Aria. Whether these men are a help or a distraction is really what Valora’s mission is all about. How do you sum it all up when you get casual requests about your story? What elements do you focus on? This entry was posted in On Writing and tagged elevator pitch, Emerald City Writer's Conference, Fae Hunter, faery, fantasy, fantasy romance, indie author, indie writer, marketing, pitching, writing prompts. Bookmark the permalink. I hate that question too. How to sum up your book in one or 2 sentences? It’s funny how we can write books but talk about them? No way! LOL! Oh, I hate writing these things…! I find the advice of Alexandra Sokoloff to be very helpful though, she gives some great examples of what a good premise should be and breaks it down into components.